This page picks up on ideas given on the Kobayashi fuseki and mini-Chinese pages. 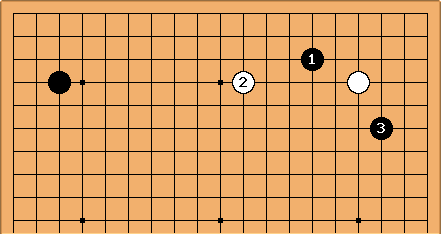 When Black approaches with it is normal for White to defend the corner with a or b in place of . 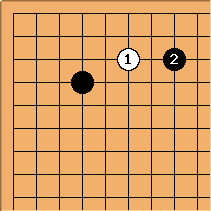 Then Black can extend back to the middle of the side to make the Kobayashi formation by playing at the star point on the upper side, marked with a circle. The pincer at is seen in fewer than 10% of pro games. Supposing the normal development shown in the right-hand corner, White has sente to approach in the left-hand corner with a play such as . 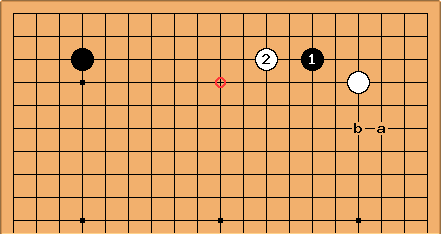 In this position the area of marked points has become important. It isn't immediately clear how White exploits it, though. Again a pincer to prevent Black building up a mini-Chinese formation along the side. Once more this is seen in professional games, but isn't highly favoured (no more than 10% of examples). This is a main variation. 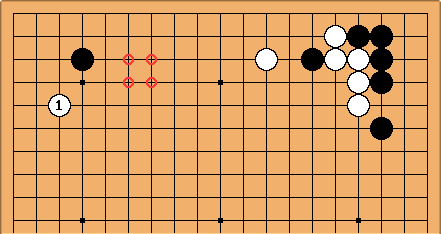 White plays to gain the maximum on the right side. 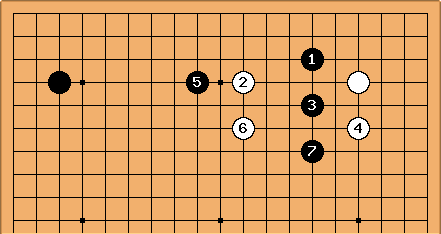 White's next plays on the other side would be a or b, which are good shape but gote. There is nothing here really to support the common amateur idea that playing a pincer confers an advantage, though. In both cases Black takes territory early in White's corner and pros like profit ---> Who doesn't? 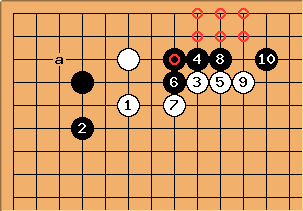 A quite different attitude is shown by this counter-pincer strategy, played quite often recently by Kato Masao. Black starts a running fight on the top side. This suits Kato's style but should be considered a difficult choice. Actually, you'll find many good amateurs who like to play for influence; and you'll find some pros like Takemiya who aren't concerned about early profit. I'd say they are playing different games; but you won't get a Takemiya fan to agree. Yes. The proportion must have gone up recently (2003) since the number of examples is now like 200 out of 1500 games. However the winning percentage looks more like 45%: which isn't great. So could someone please make it clear what the disadvantages of playing a pincer are ? As Charles stated, as an DDK I feel getting pincered is always disadventageous to me. This is one of the most common pincers you will find, maybe even the most common pincer of them all. (See also: 4-4 point low approach one-space low pincer joseki). Here is a common continuation. Note how splits the 4-4 corner stone from the pincer. White takes the initiative, and Black spends the next 5 moves defending his groups. First he defends the 4-4 stone with , and then after leans on his pincer stone, he spends - - - defending that side. 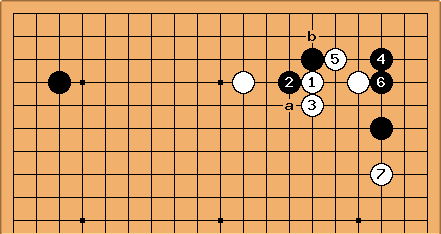 At the end, white has gotten some influence (the - - - - wall), and his group is reasonably safe, while black got some territory (the marked area). Black did not get any territory (yet) on the other side, as the 3-3 invasion at a is still open to white. All in all, a reasonably balanced exchange. Hope this helps! If you have more specific questions (about specific pincer situations, for example), feel free to ask (here, or at BQM).